Phil Dowson has been called into the England squad as cover for injured flanker Hendre Fourie. The Northampton back-rower was due to captain the England Saxons against Russia in the Churchill Cup on Wednesday, but will instead fly from the United States to link up with Martin Johnson's squad in Australia. Fourie played in Tuesday's 28-28 draw with the Australian Barbarians before being forced off at half-time with a right calf problem. 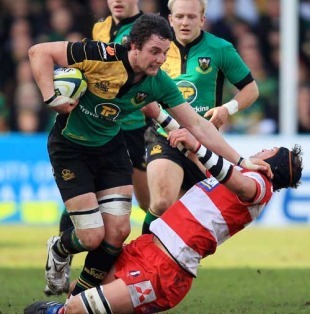 Dowson, who was shortlisted for the Guinness Premiership player of the season, was considered unfortunate not to have made the initial 44-man senior squad after an outstanding season for Northampton. His preferred position is No.8 but he is comfortable at blindside flanker and had been due to play for the Saxons at openside. Leicester-bound lock George Skivington will now take over as Saxons captain with Saracens flanker Andy Saull coming into the team.